Prefer to print your own thank yous? This listing is for you! 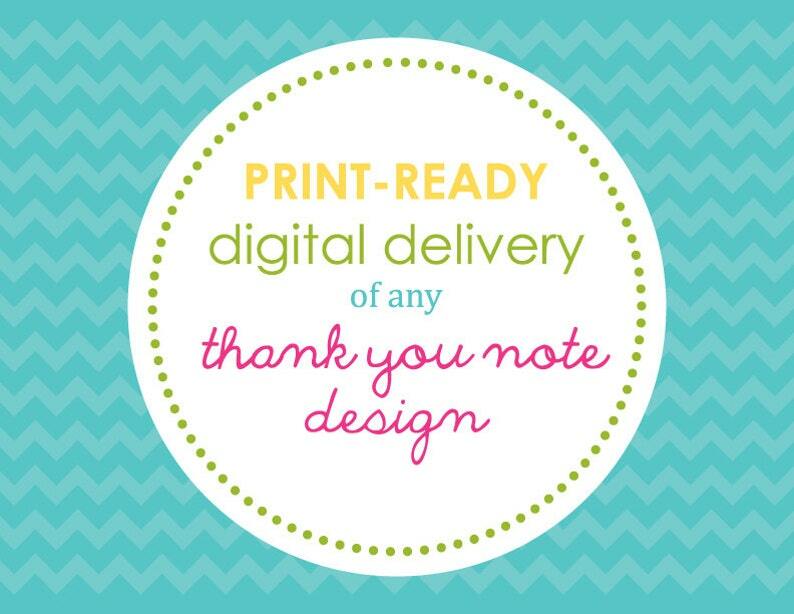 This listing is for the digital delivery of a print-ready file of any Sweet Wishes thank you notecard. You only need to purchase this listing to order. Just let me know during checkout which invitation design you would like. Include your personalization details in the "Notes to Seller" section during checkout. Do you like the design, but you're not crazy about the colors on the invitation? No problem! I am happy to accommodate color changes and minimal design change requests - just make note of it in the "Notes to Seller". A digital proof will be emailed to you promptly for your approval. Once the proof is approved, you will receive both a print-ready PDF and JPG via email. Please be sure the email address associated with your Etsy account is accurate, as to not delay the delivery of your files. Love the digital invite! The shop owner, Kelly, was wonderful to work with. I had to request a couple of edits and she was very timely and could not have been nicer about making sure that I got exactly what I wanted/needed.